Travelling to New York, I made it my duty to explore Brooklyn a little more as it’s so easy to be drawn into all of the nooks and crannies of Manhattan. That’s no bad thing, I love Manhattan, but there’s more to New York than one island.. Admittedly I did get lost (what’s new? ), but that just brought me places to places I didn’t know existed. Finally finding the Brooklyn museum, I intended to just get a sense of the whole museum until I saw a poster for Mickalene Thomas’s exhibition. A painting of a black woman with big rhinestone studded eyes against a backdrop of kitsch and colourful wallpaper patterns. I had to see the rest. Not having ever heard of her before, I had no idea what to expect. I was first confronted with a painted collage of geometric shapes filled with various colours or patterns to make up a landscape. Being a pop art enthusiast, I was attracted to the colour. Portraiture was next. I prefer portraits to landscapes, looking at them and imagining how they sound and what they do. All of the portraits were of glamorous black women sitting or lying in poses that you normally see in paintings from hundreds of years ago; languidly laying on a fabric adorned bed or posing in their surroundings. One thing they had in common were that they all looked out to the viewer, making you feel they are observing you rather than the other way round. This was enhanced with the rhinestones that were applied to every painting as well as the bountiful colour and the nostalgic patterns taken from vintage decor. 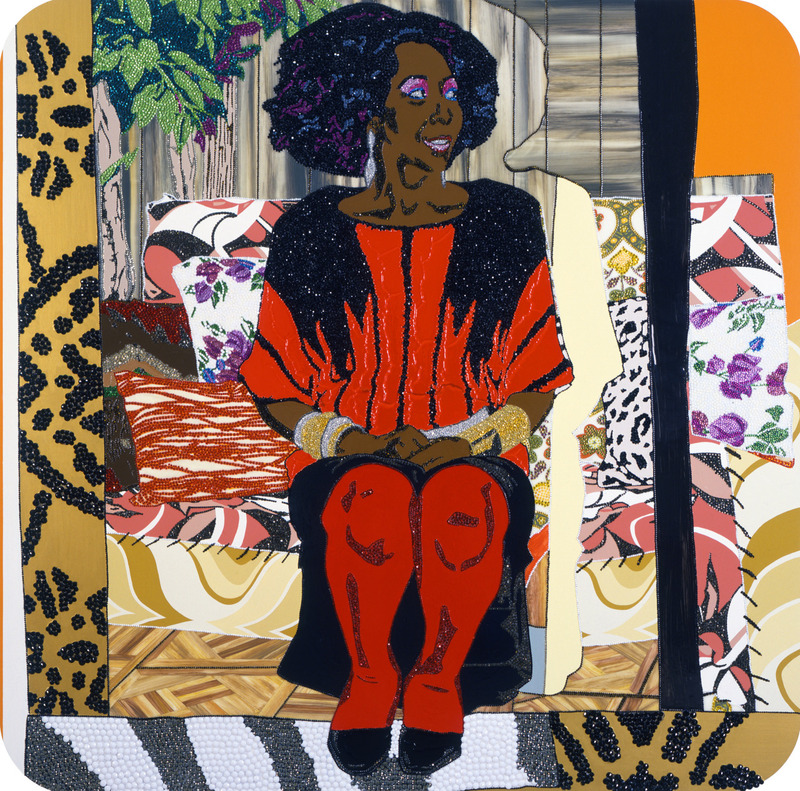 Mickalene’s work process was on display too. Collages of the photographed subject and house decor patterns inspired by where she grew up and landscapes were framed on the wall along with Good Housekeeping books from the fifties. I myself use collages in my notebooks to start ideas for collections and am always drawn to vintage patterns, so I really related to this. The next room felt like I was stepping into the paintings. Sections of rooms were furnished in the same patterns from the paintings but on closer inspection, everything was collaged and slightly off kilter. Music from the seventies played throughout so I felt like I went inside her head. The last room was a video of her mother, also a subject of her paintings. She told her life story interspersed with images from her youth which all tied back to the work on display. I definitely think I will be using this exhibition as inspiration in the future.